A few days ago I posted a historical short story here: Alric and the Sack. I mentioned that I would revisit the story to indicate what was based on historical evidence, and what was not. The story is a fictional reimagining of the terror of the monks on the Island of Lindisfarne on June 8th 793 when Vikings arrived and attacked them, destroying the church and killing many of the monks. It is based on real events. As the story seemed to flow best written in the voice of a third person limited omniscient narrator, it wasn’t necessary to expand on all the references to actual historical details. I’ve been researching a lot of historical detail for another project, and have decided that too much explanation in the text is not conducive to reading. Equally, forcing the text to fit details I do have can come over as wooden or contrived. Stories have to flow their own way; if a story does not demand a close description of an earthenware pot, then the fact that I have extensive primary evidence I could use does not mean I should fit the story around it. Sometimes you just cannot place an earthenware pot in the tale. Equally, there are some details it is possible to intuit or make an educated guess about, and always ways to research what is known, through libraries, the internet, travel and museums. I did a little of each of these in my preparation, and chose the event as it resonated with things I care about (Scandinavia, faith communities, the North East of England, strange languages and Celtic artwork). I chose the name Alric, a genuine eighth century male name, avoiding the spelling Ealric so that it would be more approachable for modern readers. (I remember some years ago reading Harry Potter and the Philosopher’s Stone right through without knowing how to pronounce Hermione. I don’t have any excuse either, having studied Greek). It has not happened by chance, but is the sign of some great guilt. Alcuin does not state explicitly what ‘great guilt’ he is referring to, but only six weeks before the raid in late April 793, a scoundrel called Sicga had been buried at Lindisfarne. Sigca, born a nobleman, had been part of a conspiracy to kill King Ælfwald of Northumbria in September 788. In February 793 he killed himself. It was not necessary to bury a murderer (who had indeed also committed suicide) on Lindisfarne, and some were surprised that the bishop had allowed it. The prevailing theology in the eighth century would interpret Viking raids as a divine punishment for sin. The fiery dragons may well have been northern lights, which can occasionally be seen as far South as parts of the United Kingdom. Vikings had traded widely and had discovered that isolated and unprotected island monasteries in the British Isles had a wealth of treasures which could prove to be easy pickings. They had no real understanding of Christianity, or that local people sent valuables to monasteries for safe keeping at the time. As cruel and unfair as it might have seemed to the Anglo-Saxons, this discovery of easy wealth must have been a euphoric time for the invaders. There were religious items of some value stored at Lindisfarne too. The Lindisfarne gospels and the relics of St Cuthbert (who had been bishop there until his death in 687) survived unscathed. The beautiful and highly valuable gospel volume was written and illustrated over a period of about ten years in Latin on vellum (calf-skin) by Eadfrith, also a bishop at Lindisfarne, who died in 721. We know it was later pressed, bound and covered with a metal case with jewels. If the Vikings had seen it, they would certainly have looted it. But they didn’t. The gospel had other adventures after this, including reportedly being lost at sea and miraculously found, and now belongs to the British Library. I was intrigued that no legend explaining the safe evacuation of the book survives. When Higbald is reading ‘Pax vobis’, Peace to you, he is quoting from Jesus’ words to his disciples after his resurrection (Luke 24:36; John 20:21, 26). The peace of a risen Saviour deliberately contrasts the sudden and unexpected babble of the raid. When the monks sing “Eripe me Domine ab homine malo,” they are reciting Psalm 140, which begins Deliver me, O Lord, from evil men. This is also deliberately chosen, and becomes Alric’s refrain as he escapes. 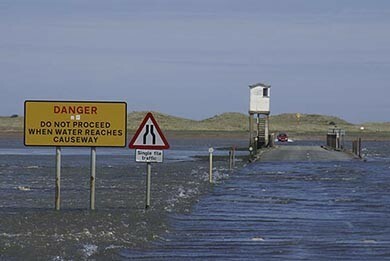 Lindisfarne is a part-time island. Twice a day the tide cuts the community off from the mainland. I tried to investigate the tide times, but was not able to find out the details for such a distant date in history. As a result, I skirted around the exact timing of the raid. The modern paved causeway is about a mile long, and any route he might have taken would have been an exhausting run for Alric if he did think the tide was approaching. I learned other things about what Lindisfarne would have been like in the eighth century however. There would certainly have been a collection of buildings on the island, but not many of stone except the church and an outer wall. There was a cemetery, possibly some stained glass and through trade networks, some high quality metalwork and pottery. (Cuthbert had even had an elephant ivory comb). Pilgrims came to visit the sacred site. I used universal examples of fear, anatomy, bird life and the weather to link the characters’ experiences to those of the modern reader. I did not know everything I needed to though. I assumed my character was familiar with the same seabirds found at Lindisfarne today, and that he slept in a straw bunk. I chose to hide the gospel in a sack, although I don’t know how big sacks were at the time; they are not the kind of item which survives twelve centuries in a wet climate. I did not find any contemporary art depicting sacks, but decided that it is likely a gospel would fit in a typical size sack for holding a reasonable weight of grain or wool. Sometimes you can make reasonable assumptions, but I do like to understand what is based on fact and what is pure fiction. I didn’t want him to sound too modern in his language, but needed to find a place of overlap between the ancient experience and today. Lindisfarne was deemed a significant and sacred site; it was one of the possible locations for the arrival of Christianity in the British isles. It was also the location for the first serious Viking raid. History tells us of the huge impact the Scandinavian peoples had on the British Isles in later years. And for some reason, though people died and buildings were burned, the Lindisfarne Gospels escaped. I’m very glad that they did.